Some time ago on a visit to Rome, I noticed that the crow in the city was the crow that I associated with the wild moors and hills of Arran. It was the Hooded Crow. I was puzzled. The crow family is cosmopolitan They are considered to be the most intelligent of the birds. Their total brain-to-body mass ratio is equal to that of great apes. Crows are medium to large birds; many species are black or black and grey; some are pied; while others are more colourful.species breed in the UK. While all have been recorded on Arran, only four breed here Raven, Jackdaw, Carrion Crow and Hooded Crow. It is the familiar Carrion and Hooded Crows that are the focus for this article. The Hooded Crow with its black hood, throat and wings but grey body and the Carrion Crow, by contrast solid black in colour, are closely related. Until recently, they were regarded as the same species. The map shows their distribution across Europe. To the west, the skies generally belong to the Carrion Crow. To the east, the Hooded Crow rules the roost, including Rome. In areas where the two species overlap there may be some interbreeding with hybrids showing a mixed grey and black body plumage. How is it felt that this distribution came about? During the last Ice Age, ending about 10,000 years ago, the European Crow population was forced to retreat to ice free areas in the Balkans and the Iberian Peninsula. These isolated groups developed striking plumage differences, the grey-and-black Hoodie in the east, and the all-black Carrion in the west. Voice and general behaviour changed but little, so that when the ice retreated and the separate groups expanded to meet in middle Europe, they were still able to interbreed and produce fertile hybrids, but only over a narrow zone of overlap. Arran is one of those overlap areas. From the BTO publication Bird Atlas 2007-11: the Breeding and Wintering Birds of Britain and Ireland by Dawn Balmer, Simon Gillings, Brian Caffrey, Bob Swann, Iain Downie & Rob Fuller, the breeding distribution maps for Carrion and Hooded Crow show areas like Arran where both breed and interbreed. On Arran there are Hooded Crows, Carrion Crows and viable hybrids of the two that show varying amounts of black and grey plumage. The next time you see a crow on Arran check it out. Is it a Hoodie, a Carrion or a mixture of both? 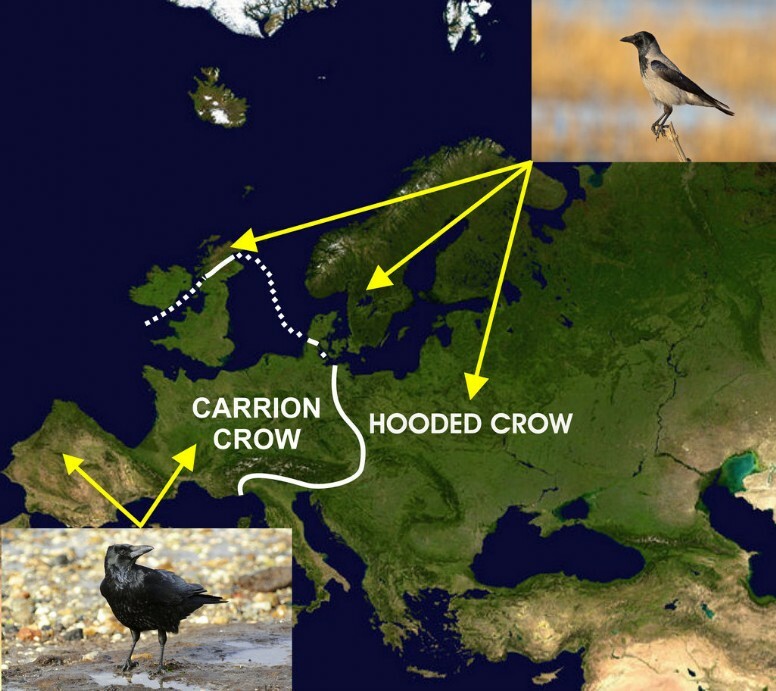 The status of Carrion Crows and Hooded Crows has been debated ever since Carl Linnaeus, the founding father of taxonomy, declared them to be separate species in 1758. A century later, Darwin called any such classification impossible until the term 'species' was defined. The crows are known to cross-breed and produce viable offspring, so lack the reproductive barriers that some biologists consider essential to the distinction of a species. For the crows themselves this human discussion does not matter.